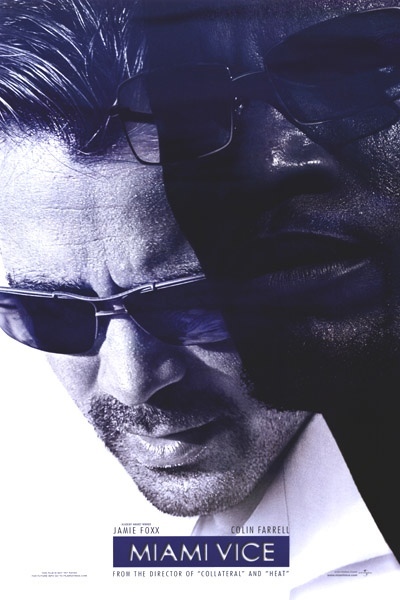 Starring: Colin Farrell, Jamie Foxx, Ciaran Hinds, Gong Li, Barry Shabaka Henley, Justin Theroux, Naomie Harris, Luis Tosar, John Ortiz, Eddie Marsan, Isaach De Bankole, John Hawkes, Oleg Taktarov, Tom Towles, Tony Curran, Kristen Stewart. Director Michael Mann does a retread and modern film version of his highly successful 1980’s television series and despite his calibre, this turns out to be just like all the other poor makeovers of hit TV shows. Detectives Sonny Crockett (Colin Farrell) and Ricardo Tubbs (Jamie Foxx) work undercover investigating narcotics-smuggling in Florida. But when Crockett falls for the beautiful wife (Gong Li) of a powerful arms and drugs trafficker, and Tubbs’ loved ones come under threat, their personal and professional lives start to mesh together. Much like “Heat” and “The Insider”, with similiar wonderful cinematography (complete with intense close-ups and methodical pace), giving the impression that we’re involved in the action. Problem is though, the action is not exciting enough. It’s too slow. Far too slow. This had real potential and from the beginning it looks like we’re going to be treated to another classic like the previous films mentioned but the normally reliable Michael Mann (especially in this genre) delivers a damp squib. Foxx and Farrell make a great Tubbs and Crocket, full of style and intensity but they’re left to basically wander around for over two hours, looking mean, tanned and brooding. The editing and camerawork are excellent in capturing the urban landscape of Miami but it’s not enough. It is without doubt, all style and no substance. All buck and no bang and definitely no bark OR bite. It took me three attempts to get through it, without falling asleep and that’s just not what you expect with the style and excitement of a usually on-form Michael Mann. A massive let down. Mann can do much better than this, with the most impressive thing about it being how Farrell managed to get away with successfully sporting a mullet and handlebar ‘tashe. Not an easy combination and more impressive than the film itself. This entry was posted on January 27, 2012 at 10:54 pm and is filed under Action, Drama, thriller with tags 2006. You can follow any responses to this entry through the RSS 2.0 feed. You can leave a response, or trackback from your own site. I wanted to like this movie so much being a huge fan of one of the coolest TV shows ever (in my limited view), but it is as you say “a poor makeover.” Dead on accurate review Mark. 😉 A better choice for Mann modern film I guess would be Collateral (2004) which I enjoyed. Thanks I always appreciate it when someone drops in on an old review. My writing has changed quite a bit since then but my opinion on the film still stands. A real disappointment from the usually reliable Mann.